The latest iScan processor provides VRS ClearView for upscaling to UHD/4K and enhancing less-than-perfect video. UHD/4K TVs are quickly becoming mainstream as prices fall and manufacturers migrate UHD's higher pixel density to their mid-range and lower TVs. But most of the content being viewed on all those UHDTVs is still HD or even (shudder!) SD, so a high-quality upscaler is a must for those taking the UHD plunge. Many UHDTVs have excellent upscalers built in, but some don't. 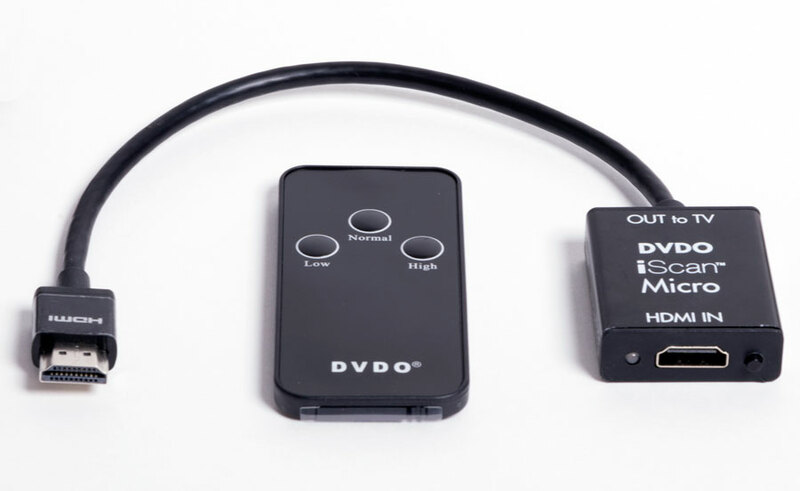 If your UHDTV isn't up to snuff in the upscaling department—and even if it is—DVDO has an inexpensive solution that is likely to improve the look of HD and SD content, even highly compressed online-streaming content. The company just introduced the latest in its highly regarded iScan video-processor line called the iScan Micro, which implements the acclaimed VRS ClearView technology with adaptive scaling, detail and edge enhancement, mosquito-noise reduction, and video smoothing. In addition, it processes video and graphics independently, optimizing each as needed. Of course, most AVS members scoff at edge enhancement, but there are a few exceptions—for example, the DarbeeVision Darblet DVP 5000 is found in many AVS members' home theaters, though it does not upscale to UHD/4K. Similarly, the various versions of DVDO's iScan with VRS have long been regarded as superb image processor/enhancers, and I imagine the newest iScan is no different. The iScan Micro is a tiny device that supports HDMI 2.0 at 18 Gbps and plugs into one of the TV's HDMI ports. (It does not support HDCP 2.2, but that's not important, at least not for a while, since it's only expecting to receive HD and SD signals.) It comes with a remote that lets you select the level of processing, and it sports a port for the included IR sensor, which is important since the unit itself is hidden behind the TV. Even better, it will carry a price tag of only $129 when it ships by mid-year. Many readers will notice that the iScan Micro is very similar to the Seiki U-Vision, which sells for around $50. Is the iScan Micro 2.5 times better? Only a direct comparison will tell, an exercise I intend to conduct when the iScan Micro becomes available, so stay tuned for that!